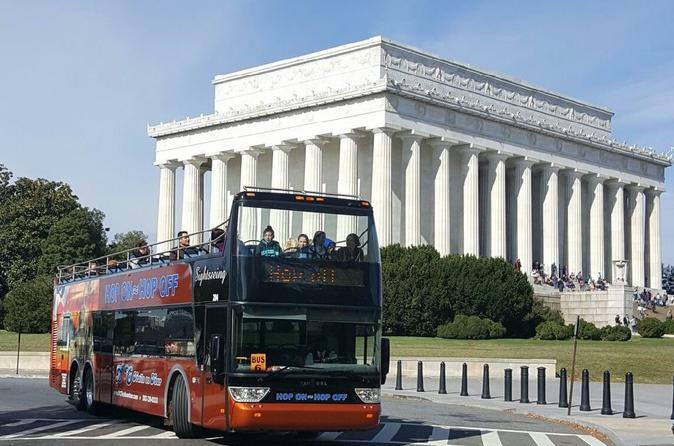 From the comfort of climate-controlled tour buses, explore the sights of Washington DC with a hop-on hop-off pass that provides easy transportation to the capital's must-see monuments, memorials, and museums. Listen to live narration on board as you're driven around the city, and hop off at any of the 20 stops to explore attractions such as Lincoln Memorial or the National Air and Space Museum at your own pace. Then rejoin the tour when you are ready to move on to the next stop. Select the 2 day pass option and receive a bonus night tour. Night tour and harbor cruise bonus are based upon availability. Harbor cruise voucher may be picked up at stop #1. Night tour may be reserved by following the voucher instructions provided after your purchase.